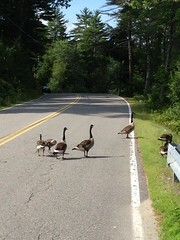 Some of our fellow-travelers, on the road near the lake. A ripple of chatter moves through our gathering: laughter, disbelief, anxiety. Most of us are naked beneath the lake's dark waters, and the sudden arrival of the police breaks the integrity of our ritual space. Someone who is clothed walks up the beach to find out what's going on. Are the police going to stop our ritual? People in the surrounding houses, it turns out, have seen the spectacle of these dozens of women entering the lake with our varied bodies, and they called the cops. (Maybe they think we're about to enter into some kind of Sapphic bacchanal?) The police have come, embarrassed but firm, to ask us to clothe ourselves. Some of us are scared. Some of us are amused. Some of us are upset. In any event, we're already underwater; our ritual is already underway. There's no point in getting out again until we're done. (The waters are so dark that once we're submerged, we aren't visible anyway.) We agree that we will stay submerged, and that we will impart this new instruction (enter the lake clothed, and you can do what you want once you're underwater and invisible) to the men when they come for the next shift. Once the police cars depart, we refocus ourselves and return to our mikveh buddies. It's difficult to regain precisely the spirit-filled consciousness I felt before the police arrived. It reminds me of being a nursing mother. I used to get exasperated when I encountered people who were offended by the sight of a baby at the breast. "This is what my body is for," I always wanted to say. "If you're bothered by it, then don't look. But don't ask me to hide. What I'm doing is holy." What we're doing today is holy, too: nourishing our souls with a return to the divine womb before Shabbat, as symbolized by this lake of living waters. And we had permission to use this lake in this way. Why is it always incumbent on women to conceal ourselves, instead of incumbent on other people to avert their eyes? After a night's sleep, I will be more easily able to empathize with the neighbors across the lake who saw us and were startled. (This is probably...not typical behavior in rural New Hampshire. And while we'd received university permission to use the lake for our mikveh, we hadn't realized that people across the lake or out on boats would be able to see us and would be alarmed.) In the moment of the mikveh, I'm caught between amusement and frustration. But I do my best to shake the frustration off. The waters are still warm, and the smiling faces of my sisters are still sweet, and Shabbat is still on the way. I reflect on the week now ending, and immerse four times, one for each of the Four Worlds. Each time as I inhale, close my eyes, and go under, I can feel my hair floating up and then following me down. I can feel the warm swirl of lake waters around my body. When I come up, renewed and reborn, the world is bright and gleaming. And when we are done, the chanting breaks out. We sing the chant written for mikveh at the old Elat Chayyim: "Woman I am, spirit I am, I am the Infinite within my soul, I've got no beginning and I've got no end, oh, yes I am!" We emerge from the waters whooping and dripping, sparkling with the anticipation of Shabbat, our foretaste of the world to come. As we are hastily clothing ourselves, kohenet and rabbinic student Annie Gilbert leads us in singing "You are the body of Shekhinah, you are the body of Shekhinah," and we turn to each other and sing the words to each other and beam. 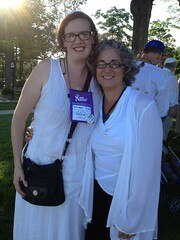 With my dear friend Deb, post-mikveh, before Shabbat. Later that evening, in the big tent, as we sing and dance and leap and clap to welcome the Shabbat Bride into our midst, I look around the room. I am wearing silvery glitter sprinkled over my face and torso, a manifestation of the internal sparkle bestowed by our mikveh. As I look around the tent, as we welcome Shabbat, I see my holy mikveh sisters, in all of our beauty, and I can't help but smile. Immersing with intention: creating mikveh experience beyond the mikveh, my post on the Mayyim Hayyim blog from 2011.